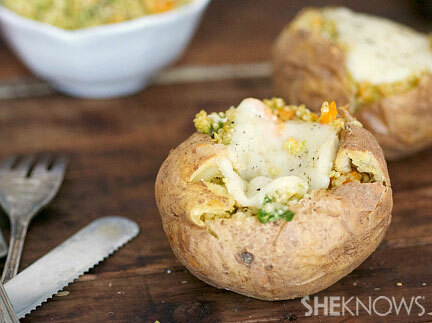 Make this trendy vegetable a main dish with one of these recipes! Brussels sprouts are taking the world by storm, and for me, it's about time they got the recognition they deserve. These trendy little cabbages aren't just healthy and cute, they're incredibly versatile too. Don't just listen to us though, try one of these recipes! 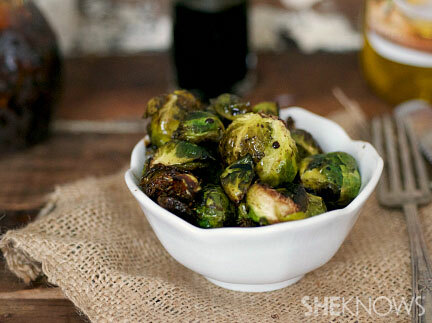 These delicious Brussels sprout recipes are perfect for any day of the week, year or month, and not just for Thanksgiving either! From creamy gnocchi mac 'n' cheese to crispy gratin, you'll find you love these healthy little vegetables just as much as we do. Preheat oven to 375 degrees F. Grease a 3-quart baking dish with nonstick cooking spray. Bring a large pot of water to a rapid boil. Add gnocchi and cook until they float to the top and are soft, about 5 minutes. Rinse in cold water and set aside. In a medium size 3-quart skillet, heat 2-1/2 tablespoons of butter. Add Brussels sprouts and cook until fragrant and golden brown, about 4 minutes. Stir in flour and stir to coat. Add milk and reduce heat to medium. Heat until mixture is thick and bubbling, about 4 minutes. Remove from heat and stir in cheddar and mozzarella cheese. Add 2 tablespoons of Parmesan and stir to combine. Mix in salt and pepper to taste. Stir in the gnocchi and toss to coat in cheese sauce. Pour the mixture into the prepared baking dish. Add remaining 2 tablespoons of Parmesan cheese and bake for about 20 minutes, or until golden. While mac 'n' cheese cooks, heat remaining butter in another skillet. Add Brussels sprouts and cook until dark brown and crispy. Top mac 'n' cheese with crispy Brussels sprouts and serve. Preheat oven to 400 degrees F. Grease a 9 x 9-inch baking dish with nonstick cooking spray. Place the Brussels sprouts in the dish. Drizzle with olive oil. Whisk the balsamic and honey together. Toss the vegetables with balsamic and honey mixture to coat. Roast for about 15 to 20 minutes, or until golden brown and crispy. Heat the quinoa and water in a medium saucepan over medium-high heat. Bring mixture to a boil and then reduce to a simmer. Cook quinoa until soft and fluffy, about 8 minutes. Mix the quinoa with the Brussels sprouts, olive oil, carrots, Parmesan cheese, mozzarella cheese and salt and pepper. Stir to combine. Fill each potato with about 1/4 to 1/3 cup of quinoa mixture. Top potato with slices of fresh mozzarella. Heat your broiler. Place potatoes on a greased baking sheet and bake for about 2 to 3 minutes, or until cheese is melted. Preheat oven to 425 degrees F. Place Brussels sprouts on a baking sheet and sprinkle with 1 tablespoon olive oil and salt and pepper. Roast for about 15 to 22 minutes, or until golden brown and soft to the touch. Remove from heat. Meanwhile, make sauce by heating the remaining olive oil in a skillet. Add onions and cook until soft and translucent about 3 minutes. Add flour, salt and pepper and heat another minute. Add the milk and bring mixture to a boil. Reduce heat to low and cook until mixture is thick, about 3 more minutes. Remove from heat and stir in cheese. Lightly grease a baking dish or mini cocottes with nonstick cooking spray. Layer 1/2 of the Brussels sprouts on the bottom. Top the sprouts with the sauce. Top the sauce with the rest of the Brussels sprouts. 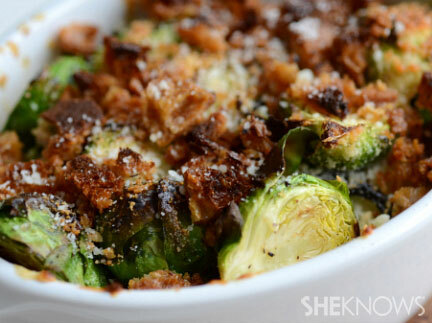 Sprinkle the tops of the Brussels sprouts with breadcrumbs or croutons and additional Parmesan cheese. Turn oven on to broil. Broil Brussels sprouts for about 3 to 5 minutes, or until sauce is bubbly. Claire is an aspiring nutritionist (and soon to be culinary student) with a serious addiction to bacon, goat cheese and online shopping. She is recently married to a social media guru who loves *almost* everything she conjures up. In addition to writing for the Food section of SheKnows, she is a full-time recipe creator (and taste tester), a writer for FabulousFoods.com and a contributing writer for the Home and Gardening section of SheKnows. You can also follow her musings and find delicious healthy recipes on her food blog, The Realistic Nutritionist.